I haven't blogged for ages as I got very busy and have had visits from family, which are always a delight. We had a wonderful week of sunshine and temperatures around 20 degrees C which confused the plants but which felt wonderful after such a wet winter. We are now in the throes of more 'normal' weather of chilly days with an occasional shower or burst of sunshine. I have started planting seeds in earnest, many of the annual herbs start off in pots and the propagator is roaring away full of tomatoes, squashes and those seeds needing a bit of warmth. 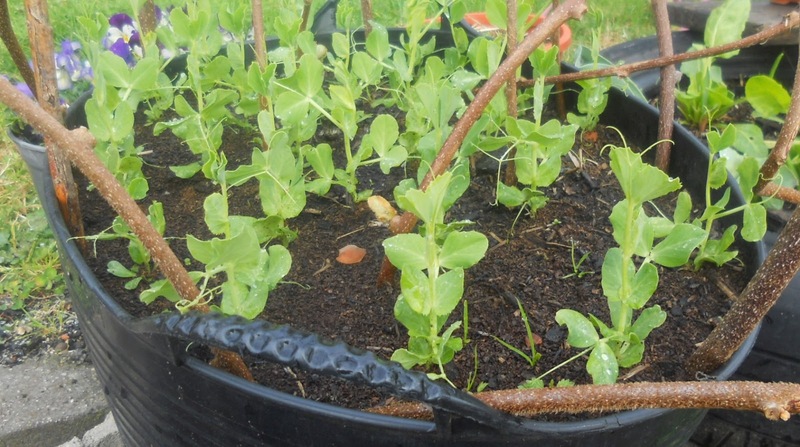 These peas are in a tub with more in the veggie patch and some of the spring brassicas are coming on. Trees are emerging from their winter hibernation and hint of blossom are showing. This is the first apricot blossom from this tree which we planted last winter. I have just finished planting out some cut price ornamental shrubs from Lidl I can never resist a bargain. This tub has an interesting mix of tulips, freesias and self seeded chard. I will watch what happens and move the chard if it gets too smothered. My daughter is due to visit later this week. I have a nice list of work for her to do with me. Having two people working here allows me to make so much more progress on the bigger jobs. I think we will end up doing more fencing. The big dog Toby, is causing havoc in my vegetable patch and the only real way to stop him will be to fence it off entirely as he currently sneaks in from the bottom field. He tells me that uprooting and chewing on brussel sprout plants is so much fun he can't resist.